Corrugated metal hoses come in many configurations. These tools can help ensure you select the right corrugated metal hose for your application. There are many components in a metal hose assembly and care should be taken when selecting each of them. Moreover, the components have their own unique technical limitations so it is important to make sure each of the components is compatible with your application. In much the same way as a “chain is as strong as its weakest link”, a metal hose assembly will only perform to the limits of its weakest component. Once the components have been selected, the quality and skill of the fabricator assembling the components becomes important. The procedures and care used when fabricating assemblies also has a dramatic effect on the assembly’s overall performance. Hose Master has invested a considerable amount of resources to researching metal hose fabrication and developing a state-of-the-art fabricating center. In addition, we share the welding technology we have developed with our fabricating distributors. 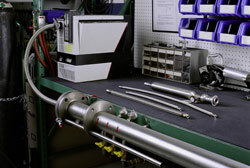 All of this is done to promote quality and consistency in fabricating metal hose assemblies. In this section, we will discuss the various components that make up a corrugated metal hose assembly, and what information a metal hose fabricator will need in order to make an assembly for your application. If you need assistance determining the information, we have also included an explanation of how to analyze the application and make the appropriate selections. In order to make an assembly, the fabricator will need answers to the following five questions. For more information about any of these questions, or for a list of available options, click the topic heading for a more detailed explanation. If you have the answers to these questions, a metal hose fabricator will be able to make the assembly. If you do not know the answers to all five questions, you will need to obtain them. The next section is designed to help you determine the answers. Size – The diameter of the connections in which the assembly will be installed is needed to provide a proper fit. This information is required. Temperature – As the temperature to which the assembly is exposed (internally and externally) increases, the strength of the assembly’s components decreases. Also, the coldest temperature to which the hose will be exposed can affect the assembly procedure and/or fitting materials. If you do not provide this information it will be assumed that the temperatures are 70° F.
Application – This refers to the configuration in which the assembly is installed. This includes both the dimensions of the assembly as well as the details of any movement that the assembly will experience. This information is necessary to calculate assembly length and required flexibility. Media – Identify all chemicals to which the assembly will be exposed, both internally and externally. This is important since you must be sure that the assembly’s components are chemically compatible with the media going through the hose as well as the environment in which the hose is installed. If no media are given, it will be assumed that both the media and the external environment are compatible with all of the available materials for each component. Pressure – Identify the internal pressure to which the assembly will be exposed. Also, determine if the pressure is constant or if there are cycles or spikes. This information is important to determine if the assembly is strong enough for the application. If no pressure is given it will be assumed that the pressure is low and there are no pressure surges or spikes. End Fittings – Identify the necessary end fittings. This is required since fittings for the assembly must be chosen to properly fit the mating connections. Dynamics – Identify the velocity at which the media will flow through the assembly. Since corrugated metal hose does not have a smooth interior, rapid media flow can set up a resonant frequency that will cause the hose to vibrate and prematurely fail. If no velocity is given, it will be assumed that the velocity is not fast enough to affect the assembly’s performance. 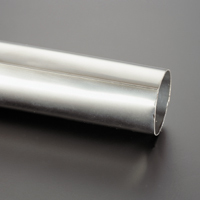 After the tube has been welded, corrugations are formed into the tube to make it flexible. There are two corrugation profiles, annular and helical. 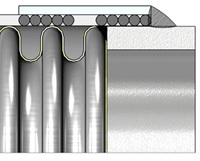 Corrugations are formed into the tube using a variety of methods. 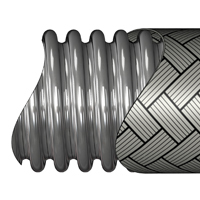 Hose Master’s proprietary methods enhance flexibility and cycle life, maintain wall thickness, reduce concentrated residual stress, and minimize work hardening. Enhances flexibility and cycle life. In addition to our line of annular, corrugated hose, Hose Master offers two helical hoses specially designed to maximize performance without the drawbacks of traditional, mechanically-formed, helical hose. Rather than welding a tube and mechanically forming the corrugation, these products are made from stainless steel strip that is formed before welding. Because it is not mechanically formed from a tube, it is extremely flexible and does not contain all the residual stresses like traditional mechanically-formed helical hose. Both Extraflex and Hydraflex are made by pre-forming the stainless steel strip, overlapping the material, and then continuously resistance welding the seam together. 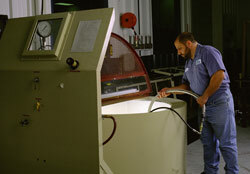 While Extraflex is made with one ply of stainless steel, Hydraflex is made with two plies for higher pressure ratings. To give corrugated hose the ability to withstand pressure, stainless steel wire is braided over the hose. 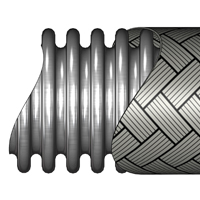 Hose may be single braided (one layer of braid) or double braided (two layers of braid) to achieve even greater working pressures. Braided braid is used on large diameter hose. High Percentage Braid Coverage – Hose Master has a high percentage of braid coverage yielding better cycle life and protection against damage to the hose. Machine Braided Hose – Hose Master weaves the braid directly onto the hose ensuring that the braid fits tightly against the hose, preventing potential hose deformation or squirm. When selecting a hose, you must consider three variables: pressure carrying capability, flexibility, and chemical compatibility. Temperature – As temperature increases, hose working pressure decreases. After you have determined the proper alloy (see “Chemical Compatibility” below) go to the “Temperature Derating” table and match the alloy of the hose and braid with the highest temperature to which they will be exposed (either internally or externally) to obtain the proper derating factors. Then multiply the hose’s Maximum Working Pressure by the most limiting temperature derating factor. Dynamic Pressure – Pulsating, surge, or shock pressures, like those encountered with quick opening or closing valves, can inflict severe damage on a hose. If your application entails pulsating pressures, the working pressure should be derated by 1/2. If your application entails shock pressures, derate the stated working pressure to 1/6 of its value. 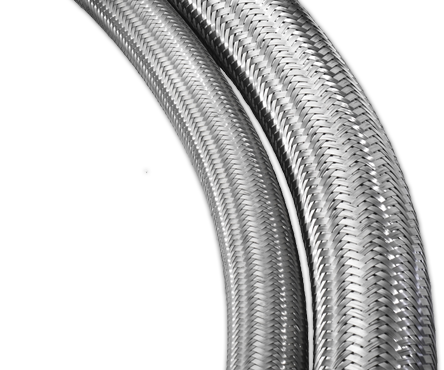 Example: 1″ Annuflex hose – T321 Stainless steel hose and T304 stainless steel braid @ 500°F with shock pressures. Catalog Maximum Working Pressue = 718psi. Temperature Derating Factor at 500°F = 0.88; and the Pressure Derating Factor = 1/6. Maximum Application Working Pressure = 718 psi x 0.86 x 1/6 = 105.31 psi. 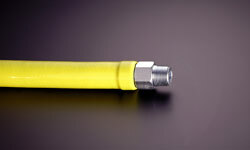 Flexibility – Confirm that the hose’s minimum bend radius is less than the bend radius required for the application. Increasing the installed radius of the hose will reduce fatigue on the corrugations, increasing assembly life. Care should also be taken for applications with vibration. Contact Hose Master’s Inside Sales Department if excessive vibration is present. Refer to the Vibration chart on page 35 for additional information. Chemical Compatibility – You must choose a material for the hose and braid that is compatible with the media being conveyed through the hose as well as the environment in which the hose is installed. When determining chemical compatibility it is important to know the temperature and concentration of the chemical(s). Although there are many resources to confirm chemical compatibility, two of the industry standards that you may use are the National Association of Corrosion Engineers (NACE) and the Compass Corrosion Guides. You may also contact our Customer Service Department which can check these sources for you. Now that you know more about the options, browse our online selection of corrugated metal hoses. Metal hose is more versatile than other hose in that virtually any fitting can be attached to metal hose. 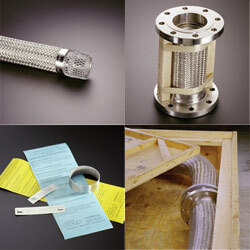 Other types of hose require special shanks and collars in order to attach fittings. For metal hose, any fitting made from a weldable material can be attached without the need for special features. This versatility also means that multiple fittings can be welded together to make custom solutions for difficult applications. Selecting the proper fittings for an application is largely determined by the mating fittings to which the hose assembly will be attached. Once the mating fittings have been identified, the hose fittings should complement the mating fittings in type, size, and alloy. Even though the selection of hose fittings is determined by the mating fittings, it is a good idea to confirm that the fittings used in the application are appropriate for the application and any necessary changes made. Ensure that the fittings are chemically compatible with and are able to withstand the pressure and temperatures of both the media and the surrounding environment. The following show commonly used fittings for corrugated metal hose assemblies. Please contact Hose Master’s Customer Service Department for end connections that are not listed. Do not torque the hose. Do not overbend the hose. Do not compress the hose. The live length of the assembly is the amount of active (flexible) hose in an assembly; that is, the hose between the braid collars. See the Length Calculation chart for more information. Overall length is equal to the live length plus the lengths of the braid collars and fittings. When adding fitting lengths be aware that the points from which measurements should be taken vary for different fitting types. When calculating overall length for assemblies with threaded fittings, remember to account for the length of thread that is lost by threading into the mating connection. See the Thread Allowance chart for more information. JIC/SAE type fittings are measured from the seat of the fitting. Elbows and other fittings with a radius are measured from the centerline of the fitting. Flanges are measured from the flange face or from the face of the stub end if one is used. Threaded fittings are measured to the end of the fitting. Hose Master has developed specialized welding, brazing, joining, and fabrication procedures to assure the integrity and serviceability of metal hose assemblies in even the most extreme applications. In each of the following sections, the standard method and available options are explained. 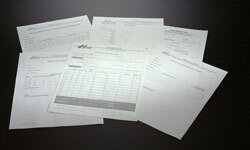 Select the options best suited for your application. Cutting the hose and braid through a hose corrugation valley. Installation of a braid collar over each end of the hose. Trimming of any excess braid. “Cap” welding the hose, braid, and braid collar together. Cleaning the cap weld surface. Placement and alignment of a fitting on the cap weld. “Attachment” welding the fitting to the cap weld. Silver brazing is also available. Consult factory. Standard fabrication sometimes leaves a portion of the cut corrugation, or corrugation “lip”, just under the base of the fitting. In specialized applications this residual lip may not be desirable. To prevent any exposed corrugation edges from causing damage, the hose can be specially prepared for welding by cutting the corrugation on the crest, rather than in the valley, thereby removing the lip. For applications in which corrosion is a concern, all crevices and fissures must be minimized. 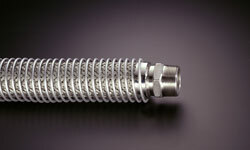 Specialized hose and fitting preparation, in conjunction with proprietary welding techniques, is available to provide a full penetration hose-to-fitting weld that is smooth and crevice free. Assemblies operating at the upper limits of their rated working pressure or in severe service may benefit from a braid-over construction. The fitting is first welded to the unbraided hose. Then a special metal reinforcing ring is installed over the fitting and next to the weld. Finally the braid is drawn over the end of the hose and the ring, and welded to the side of the fitting. This technique reduces the amount of heat introduced into the braid wires, nearly eliminates the heat effected zones of the cap and attachment welds, and maximizes the wire strength. Braid-over construction may also be used for specific high cycle applications. Note: Always test an assembly with a medium that has a smaller molecular or atomic size than the service required. 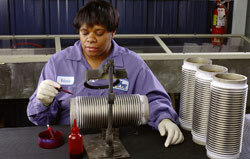 Every corrugated hose assembly is leak tested prior to shipment. Standard testing consists of pressurizing the assembly with air and then submerging the entire assembly under water. This method is reliable and sufficient for the majority of applications. While the standard test is designed to detect leaks, hydrostatic testing is designed to test the assembly’s strength. Testing of an assembly to its full permissible test pressure can be economically and accurately accomplished by filling the assembly with liquid while concurrently evacuating all air. The assembly is then hydrostatically pressurized using high pressure pumps. 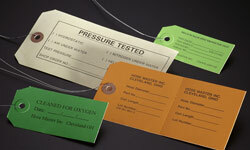 The test pressure is maintained for a predetermined period of time. Testing with air under water, at pressures of up to 2500 psi, is available for specialized applications. For a more sensitive test, the use of gases such as nitrogen or helium can be requested. Dye penetrant testing is available for both leak and for weld bead inspection, in accordance with Hose Master procedures or to customer specified standards. This is the most sensitive leak detection method generally available. The standard test method is to attach the assembly to a mass spectrometer and generate a very high vacuum in the assembly. The exterior of the assembly is then flooded with helium. The relatively tiny helium atoms penetrate even very small openings and are drawn into the mass spectrometer where they are detected and the leak size quantified. Helium Mass Spectrometer testing can be modified to satisfy customer or regulatory agency requirements. The hydroforming method of corrugated hose manufacturing inherently yields a very clean product. However, specialized cleaning for specific applications is available upon request. Contact Hose Master’s Customer Service Department for details. 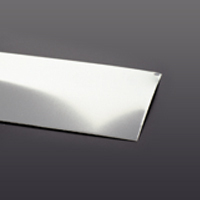 All assemblies are shipped with protectors over sealing surfaces such as threads and flange faces. 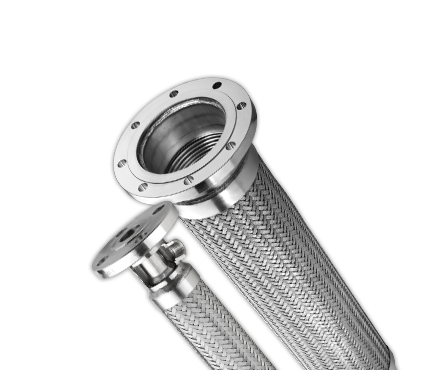 Spacer bars are installed on all shorter double-flanged assemblies to prevent compression of the assembly during shipping and handling. Special packaging is available to suit customer requirements, including crating, plastic bagging, labeling, and custom fitting protectors. Guard, made from metal and other materials, can be provided to protect an assembly from overbending, abrasion, impact, and thermal damage. 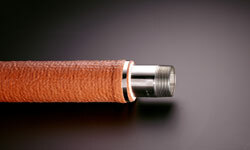 Jacket and tracer hoses are incorporated into corrugated hose assemblies in order to keep certain media at elevated or reduced temperatures so that it can be easily conveyed. A sacrificial bronze braid can be inserted between the hose and the stainless steel braid to improve cycle life. One or several accessories can be easily combined with an assembly to more efficiently transport media, protect the assembly, or both. The following pages list some common accessories along with a brief explanation of the benefits each accessory offers. This is not an exhaustive list of all possible accessories. Please contact Hose Master’s Customer Service Department with your specific requirements. When there is potential for damaging an assembly in service, a guard can be easily installed during fabrication. 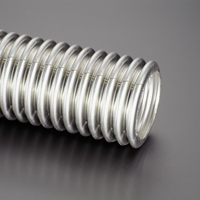 This type of guard consists of a metal spring that is attached behind the fitting. The style of guard can be tailored to meet the application and the type of hose. If the potential for impact or high temperature damage is not severe, or if the additional weight and bulk of a full metal guard is unacceptable, rubber or plastic scuff guards can be installed to protect the corrugated hose and braid. If the corrugated hose is to convey hot media, and there is a potential for skin contact, an insulated, protective jacket is available. The jacket consists of a tubular banded fiberglass insulation, covered and impregnated with silicone rubber. The jacket is installed over the corrugated hose and metal banded in place. The jacket can also be used to insulate the corrugated assembly and either prevent ambient heat from being conveyed to the media or to reduce heat loss. A variety of tags and identifications can be affixed to assemblies. These include cardboard, plastic, and metal tags. Serial numbers, application information, assembly performance capabilities, and other customer specific information can be provided either on tags or permanently engraved onto one or both braid collars. Standard written certifications for materials or inspections can be supplied for corrugated hose or assemblies. Certifications of conformance to specific customer requirements such as military certifications are also available. An interlocked hose or liner is often installed inside a corrugated hose assembly. The liner commonly serves two additional purposes, while still maintaining the full working pressure of the corrugated hose. The first is to protect the hose corrugations from excessive media velocities. Media speeds can induce resonant vibrations in the corrugations causing rapid fatigue and subsequent fracturing of the hose wall. The liner provides a relatively smooth surface for the media and, by avoiding the media impacting on the corrugation valleys, reduces the chances of harmonic resonance. The second purpose for a liner is for abrasion resistance. Even slightly abrasive media flowing at medium to high speeds can cause premature wear of the corrugated hose interior surfaces. The liner provides a smooth flow path as well as a relatively thick layer of abrasion resistant metal between the media and the corrugated hose. The liner will also help reduce pressure loss due to friction between the media and corrugated hose. Proper fit between the hoses is essential for good performance. Because Hose Master makes both the corrugated hose and liners, perfect fit is assured. See the Velocity in Metal Hose chart for more information. Applications in which the corrugated hose is subject to external abrasion, molten material splash, or impact damage may require a protective armor or guard along all or a portion of its length. A guard is typically made from interlocked or squarelocked metal hose and is welded to the assembly. Note that the bend restricter has a bend diameter equal to or greater than the corrugated hose it is protecting. A jacketed assembly consists of a “hose within a hose.” An inner or primary media conveying hose is enclosed or jacketed by a larger diameter hose. The hoses are joined at each end by specially designed fittings so that there is no media pathway between the two hoses. Jacketed assemblies are often specified when the primary media must be kept at either an elevated or cryogenic temperature. Steam is often circulated through the jacket hose to keep a viscous material in the inner hose hot and easily conveyed. 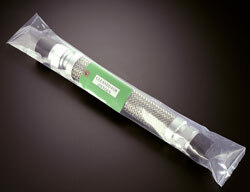 A vacuum can also be pulled on the jacket hose to insulate cryogenic liquids being conveyed in the inner hose. Traced assemblies are similar in concept to jacketed assemblies in that there is an inner, smaller diameter hose encased by a single larger diameter hose. Where jacketed assemblies surround the media with heat or cold, traced assemblies have the media surround the hose containing the heating or cooling element. The tracer, or inner hose, may also be installed in a long “U” shaped loop within the outer hose, with the steam inlet and outlet at the same end of the assembly.